SHORT LET ONLY : A flexible two/three bedroom semi detached bungalow situated in a popular road. There is a large lounge with doors to the low maintenance rear garden. Kitchen with door to garden, walk in shower with separate WC. There is also gas central heating. Outside there is off road parking to the side and the low maintenance rear garden with patio area. Chertsey offers a variety of shops and schools and there is easy access to the M25. This property is marketed by West Surrey Lettings, Surrey at £1,250 per month. Rightmove has calculated the price per week for comparison purposes only. Property reference 606. The information displayed about this property comprises a property advertisement. Rightmove.co.uk makes no warranty as to the accuracy or completeness of the advertisement or any linked or associated information, and Rightmove has no control over the content. This property advertisement does not constitute property particulars. 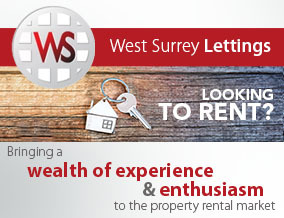 The information is provided and maintained by West Surrey Lettings, Surrey.